Interests:making things, welding, fishing, motorcycling, mountain biking. hello, I am new here and am just looking for a bit of advice from the knowledgable. im shortly going to be making a 2 x 72 belt grinder. I looked at a few treadmills but they only have smaller 1 kw motors, and I think I really need closer to 2kw, or at least 1.5 (advice taken on this), but im of the thinking if I get a bigger motor it should have more torque im looking at a 3hp, 2.2kw single phase one.. what do you think? good idea or overkill? I was also looking at vfd's and to be honest I don't really have a clue on these. ive found one (not sure if im allowed links or not so I wont - don't want to upset the management on my first post do I?) It says 220v 12A PWM variable frequency drive speed controller for 2.2kw ac motor. would this be suitable? I also notice that most VFD's are for 3 phase, does this convert 3 phase motors to run off single phase then? like I said im clueless about electrics. Also while im here, what about potentiometers? can these be used? #Any advice appreciated or if you could point me in the direction of some sort of guide, that would be great. im in the uk for electrical advice. If you want to use a VFD, you will need a 3 phase motor. I bought my VFD on Amazon. It's Chinese but that's all I could afford at the moment. My motor is 220v 3 phase 2hp. A true 2hp motor has all the power you will need! The VFD input is 220v single phase. I chose a 3hp VFD because I knew those chinese HP ratings are not actual ones. When I try to stall the motor, the safety braker sometimes jump so that was probably a good idea. Under normal use it's done well though. It's also a good idea to put the VFD in a sealed enclosure. Edit: forgot to mention you better use a 3600rpm motor. Otherwise you'll need a large custom made drive wheel to reach adequate speeds to use ceramics. A 1800rpm motor can run at 3600 but there may be mechanical restraints like balance that would cause premature wear. I just got a TEFC 2 HP 3 phase motor. One of the older ones with the cooling fins. I bought a 3 KW VFd on Amazon for it yesterday. The display panel can be separated from the VFD itself, so I can keep in a nice enclosure. thanks for the replies, im struggling to find a 3600rpm motor. the ones im looking at run 2 pole to 3000rpm, or 1500 to 4 pole. .
A 3000rpm motor will run at 3600 no problem. thanks Joel. the search continues. Interests:Tools, science, food, wine. Making things that "just work". A VFD takes mains power in, rectifies it to DC internally, then synthesizes something that looks to a 3-phase motor sufficiently like a 3-phase sinusoidal waveform for the motor to behave as if it is powered by one. The clever bit is that the VFD can vary the apparent Voltage and Frequency and make the motor run at variable speed. VFDs are available for single-phase 230V input or for 400V 3-phase input. If you get a 230V single-phase one, it can run on UK domestic mains. The biggest you'll be able to run from a 13A socket will be a 3 HP/2.2 kW. It's not really worth getting any other size IMHO. They can run motors smaller than their maximum rating, but not bigger. If you use a 230V VFD, the output will be 3-phase 230V. The vast majority of 3-phase motors up to 3 HP/2.2 kW are wound for 400V connected in Star (Wye) or 230V connected in Delta and can run fine on a single-phase-input VFD. You'll need to check when ordering though. Over 3 HP/2.2 kW, motors tend to be wound for about 700V in star and 400V in Delta to enable star-delta starting (an old-school way of reducing motor starting current. It has largely been supplanted by VFDs). These cannot run on 230V 3-phase. Here in Europe (for the present), we have 50 Hz mains: 50 cycles/sec, 3000 cycles/min. Other parts of the world have 60 Hz mains: 60 cycles/sec, 3600 cycles/min. It's the reason you'll see the different motor speeds quoted on opposite sides of the pond. A 2-pole motor will run at an RPM equal to or just below the frequency of its power supply (3000 or 3600 RPM). A 4-pole motor will run at, or just below, an RPM equal to half the power supply frequency (1500 or 1800 RPM). 6-pole: one third (1000 or 1200 RPM), 8-pole; one quarter (750 or 900 RPM), and so on. We tend to use either 2-pole or 4-pole motors and in Europe, motors generally conform to IEC standards. Across the pond, they tend to use motors to NEMA standards. NEMA motors are pricy over here and offer no inherent benefit. They tend to be used where expensive machine modifications would be necessary to change to an IEC motor. For a serious belt grinder, you'll probably want a 90-frame motor in a long casing (90L). This will most likely be 1.5 kW/2 HP if it's a 4-pole or 2.2 kW/3 HP if it's a 2-pole. The shaft size of 90-frame motors is 24mm. Because half the world uses 60 Hz mains and the other half uses 50 Hz, meaning that maximum mains speed is 3600 RPM, motors are designed to run to 3600 RPM. It is not cost-effective for motor manufacturers to design a completely different motor for each speed, so the only difference between the 2-pole, 4-pole and 6-pole motors in a particular frame size is the winding. The winding is attached to the inside of the outer casing and is static. This means that all the moving parts are good to 3600 RPM. We can run a 4-pole motor to 120 Hz to get 3600 RPM using a VFD, or we can run a 2-pole to 60 Hz to get the same 3600 RPM. At the bottom end of the speed range, most drive/motor combinations are able to run smoothly down to about 10 Hz. Below this, running from the simpler V/Hz drives, things tend to feel "coggy". The V/Hz drives use a fixed (usually linear) relationship between Voltage and Frequency to determine what will be supplied to the motor and this linear relationship tends to break down once it gets that far from the design frequency. There are also drives which have "Sensorless Vector" capability. These measure the time difference between peak current and peak Voltage internally, calculate to determine the phase angle between them, then fine-tune the Voltage in real time to maintain the design angle (the motor Power Factor defines this angle, being its Cosine). These can keep the motor running smoothly well below 10 Hz and usually down to 1 or 2 Hz. A 2-pole motor on a V/Hz drive has about a 6:1 speed range (600-3600 RPM, 10-60 Hz). A 4-pole motor on a V/Hz drive has about a 12:1 speed range (300-3600 RPM, 10-120 Hz). Either motor has a much greater speed range when run from a SV drive with smooth running down to 1 Hz achievable if needed. VFDs switch large currents very fast and produce some heat, which must be dissipated. Most VFDs have ventilation fans and allow airflow over the power components to cool them. They are intended for use in clean conditions (usually sealed electrical enclosures). If there is airborne steel dust (which is both conductive and magnetic) it will flow across the power electronics, where the magnetic fields caused by the switching will capture it and attract the metallic dust right onto the power components. The short-circuit that results is usually quite spectacular and is invariably expensive, killing the VFD completely. If they are going to be in the same room as a grinder, we need to use VFDs that are protected against such dust to IP66 or NEMA4 standards. We can either mount an unsealed drive in a sealed enclosure ourselves, with sealed control switches and speed control knob, or we can buy a drive that is designed to be sealed to IP66 from the factory and which has the sealed control knobs, etc on the front. The latter is by far the better option for the non-electrician. To buy and enclose an unsealed (IP20) drive properly, with sealed controls, to IP66 is about as expensive as buying an IP66 drive to begin with. In the US, the KBAC series of sealed drives from KB Electronics are the go-to. In Europe, the Invertec IP66 drives tend to be the ones people use for grinders. The current ones are SV drives so you get the low speed capability. I'd recommend a 90L-frame motor and an Invertek ODE-3-220105-1F4Y VFD. The drive is expensive, but it's a cry once thing. I'd try for a 2 HP, 4-pole motor for personal preference, but would be pretty happy with a 3HP, 2-pole. If you are anywhere near Lancashire, I can sort you a foot-mount 90L 2-pole 3 HP from a compressor, gratis. 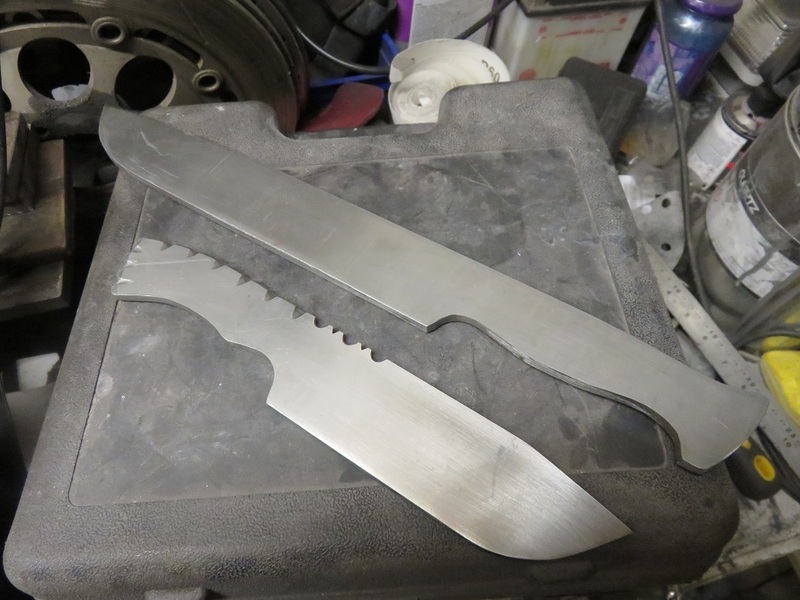 Thanks Wayne, ive had a look at the motors, but unfortunately, im trying to do this on a budget, to see if knife making is for me, and I think the postage on a heavy motor and customs tax etc would rule it out, but thanks for linking me to your site, I really enjoyed looking at your forging art, its excellent. timgunn, thank you for making this subject much easier to understand, I appreciate your knowledgable answer, and have sent you a message about the motor and a question regarding cheaper vfd's. You may want to try it without a grinder then. Do it all with a couple files and sand paper. If you still like it after that, then go for the grinder. What Jerrod said. And for the record, grinders don't absolutely have to have a VFD. It's very nice, but not required. Back in the 1980s and 90s everyone had a single-speed Wilton Square Wheel, Bader B2, or Burr-King. People like Don Fogg, Larry Harley, Buster Warenski, Bo Randall, Gil Hibben, Jim Hrisoulas, and the other big names. And that single speed was FAST. 3600 to 7500 surface feet per minute fast, depending on the size of the drive wheel and motor RPM. Myself, I'd like a VFD on my grinder, but it's paid for. It does have three speeds available using a set of step pulleys, which is good for switching between steel and wood. It's an 1800 RPM 1 hp single phase, and can do belt speeds of 900, 1800, and 3600 SFPM. It eats steel at 3600, and rarely burns wood at 900. I made tomahawks and knives for nearly ten years with an angle grinder and files, mostly files. Thanks for the replies, but im going to go ahead and build this. I will make the majority of the frame, and will just wait til I have the spare cash for a proper VFD and motor. The final design is a concoction of various designs ive seen while watching about 186 youtube videos on both diy grinders and manufactured ones. Now since I have zero experience of using these things, I would like to ask a couple more questions if I can. For those who have used these in anger as it were. The detachable post which holds the platen. Would I be right in thinking that this would be better if it was made from solid steel bar, rather than box section. Im just thinking about the tapping of bolts for the platen attachment and tool rest etc. There would be less lateral movement in solid bar, at the expense of weight. ? I suppose solid aluminium would be an option,... or would it? 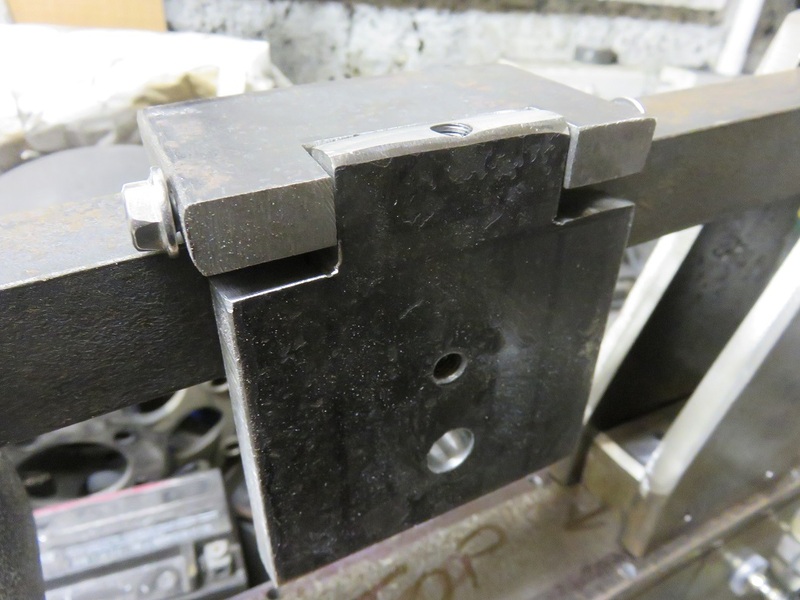 I am also thinking about the main horizontal section which holds the extendable section for the platen tool rest etc. I have seen a lot of these built with box section within box section like telescoping, but it looks a bit sloppy. I think it would provide better fit and less clearance issues if this part was made from plates to the sides, with tapped bolt holes through to horizontal plates, like the KMG, for example. Any opinions on this? good or bad idea? I also want some opinions on the top wheel post. Most of the diy builds seem to use a spring within the box section to tension the upper detatchable part, which doesn't look all that, and I would imagine it could introduce bounce in the belt (maybe im wrong) and some of the manufactured ones preffer a separate arm hinged off the top with an extension which is counter balanced with a spring attached to the post. The second option seems like a better option to me, but again, Any preference? Im also considering the option of making the grinder tilt-able, from vertical to horizontal. If you had the choice, would you incorporate this feature, or not? so many questions, but I just don't want to build this, and in 6 months time, think " I wish I had done x,y, or Z instead. I would be most grateful for your input with this. thanks in advance, I hope. In my opinion making the tooling arm out of solid aluminum bar stock is a nice option. Tight clearance, that allows longitudinal movement with nominal lateral change during tightening is nice for keeping things aligned when changing plattens. As regards tensioning arms I would grade the various different systems from best to worst as follows: manual ratchet (like the TW-90), hydraulic shock style cylinder, external spring on extended pivoting arm, and enclosed spring inside telescoping arm. The last two are debatable, but I give it to the exposed spring for ease in changing overall tension and potential repair as well as less chance of getting loaded up with dust and binding. I'm also not a fan of the floating support for the tracking wheel that many such telescoping tensioning arms designs include. One last recommendation and that has to do with the difference between belt drive and direct drive systems. In my experience the latter are quieter and less prone to vibration. I have more experience on KMGs than others, but I do prefer their way of supporting the tooling arm and, for me, the solid stock tooling arm is a must. Tubing is too flimsy and hard to tune to be vibration-free. I have no issue with the older style (external spring) tensioning my KMG has. I have run into two different Bader B3s with severe tracking issues using a similar setup, though, probably because the spring is substantially longer and less supported on the Bader B3 than on the KMG. Speaking of tracking, again the KMG system is bulletproof. Just remember that as they are used, belts lose a little tension due to stretching and expansion from heat, so you may need to re-tension from time to time to maintain perfect tracking. I don't care for the hydraulic piston thingies because they are not adjustable. The spring seat on the KMG is a large bronze nut on a threaded stud. If you want more tension than the spring is giving, just raise the nut for more tension. And I couldn't agree more about direct drive being less prone to vibration, but that does limit you to a VFD or a single speed. If you have to use a belt drive, get some link belting. It is far less likely to have vibration issues compared to ordinary V-belts. here is the first of possibly many designs, let me know what you think. 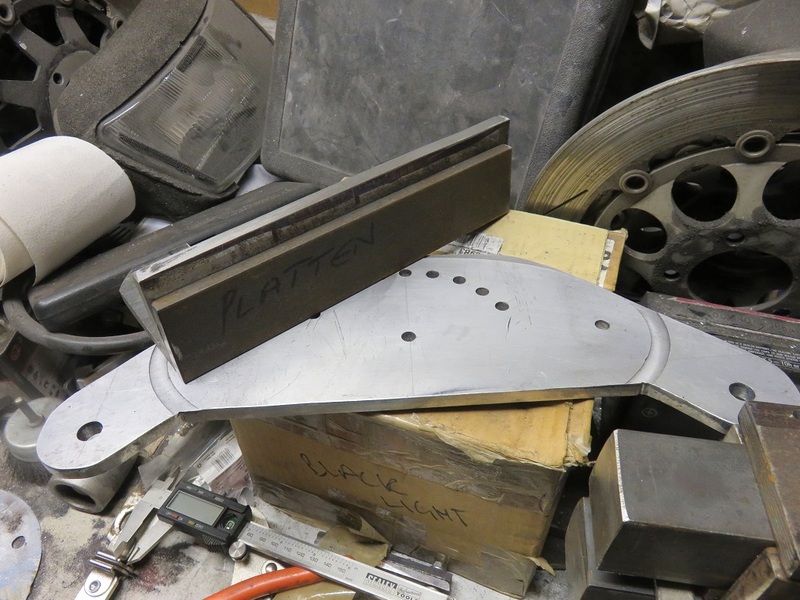 the pic has kinda cut off the dimensions for the side plates and top middle and bottom plates which hold the tooling arm, but its side plates are 400mm by 130mm by 10mm, the top middle and bottom will be 51 or 52mm to allow the solid alu bar to slide in and out. The alu bars will be held in place by 2 No m12 lever handles per bar. The 380mm length on the platen support frame, or whatever its called is just because I have a scrap piece of 10mm thick aluminium. motor will be direct drive, run off a vfd. when I can afford it. All criticism accepted as constructive, so fire away. If you have the 50mm bars by all means use them, but you'd be just as solid with 25mm. And only one lever handle per bar is fine as well, but nothing wrong with two. good to know I can save some cash on the tooling bars. I had nothing to go on for the sizes, so thanks for that, the rest can be scaled down to suit. im a bit stuck between the separate tooling arm for the rest or just attaching it to the tooling arm which is connected to the platen. im thinking if its mounted on a separate tooling arm, there is more room for movement or deflection. any opinions on this . I see kmg don't bother with a separate arm, and it would save some bucks. True, but it somewhat limits what you can do with the tool rest. The MAPP arm attachment (basically the second tooling arm you have) is a very popular and expensive aftermarket item, and both the TW90 and the new KMG-TX offer it as standard. I'd like that option myself. cool, thanks Alan, I will stick with the 2nd arm. its a steep learning curve, but you guys who use these machines all the time will know what works, what can be improved and whats not worth bothering about, I will keep the 2nd tooling arm. I was also planning a small wheel attachment eventually and possibly a contact wheel too, but I will start with the basics. I can get the materials ordered tomorrow or Friday, im itching to get started. thanks for your help, I really appreciate your input. 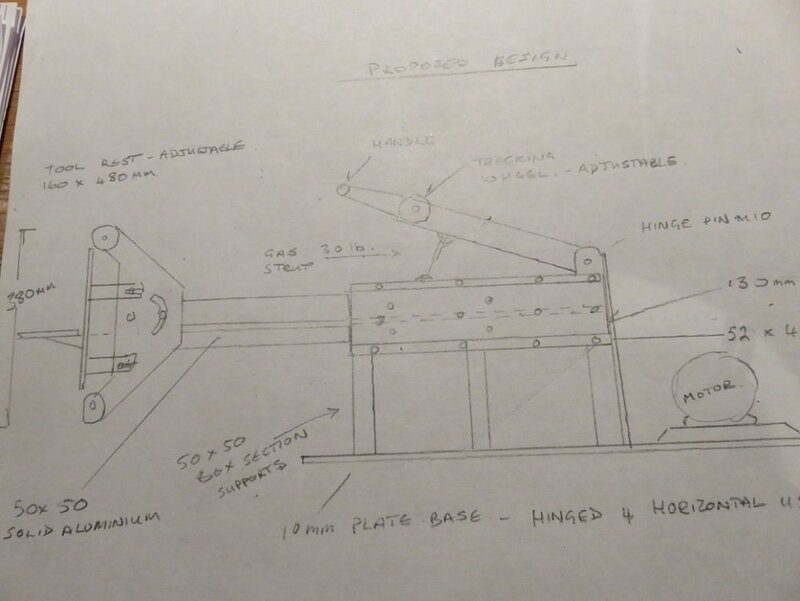 is there any part of my design that you think could be improved upon, given your experience, or do you think its good to go, if I change out the strut for a spring. Some people love the gas struts, and it's certainly simpler to install. Try it and see what you think before you go with a spring, you may like it. I wouldn't know what size spring to recommend anyway, I'd just measure the one I have, but since your machine's dimensions are different that would just be a guess. I do like serious tension on the belts, as in twang like a bass guitar string when plucked. If the 20 lb strut will do that, great. I would estimate I have my spring adjusted to 40-50 lbs, or at least I have to really lean on it hard to depress the arm. 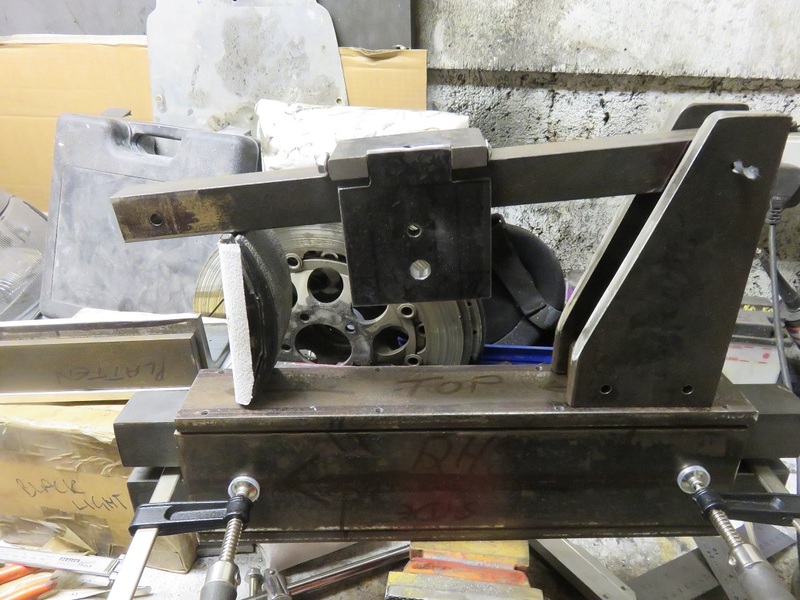 I usually loosen the tooling arm to change belts, then lean on the tension arm while re-tightening the tooling arm. One more helpful hint: make at least one of the wheels on the platen frame a rubber-faced contact wheel. Comes in really handy for touching up curves. My top wheel is a 50mm with serrated rubber. Some people use a 50mm on top and a 75mm on the bottom. This also allows you to grind fullers by tilting the frame all the way forward or backward. I was considering a 2nd tooling arm which I could keep for a couple of uses, one being for a (detachable mount) contact wheel, and another being a detachable mount smaller wheel (say 20 or 30mm dia. ) for grinding out for fore finger quillons and smaller radius fullers etc. Any ideas on the small wheel diameter which would prove to be the most useful, as im only going off the radius of my fat fingers? My older bro is coming over tonight, to help out the design part, as he is a "proper" engineer, having served his time in a traditional foundry/ coppersmiths, before going on to design and draw, and project manage all sorts of fabrication works, stuff including complete distilleries, whisky stills, condensors, all manner of stainless pipework worldwide, for both the distillation, oil & gas industries etc. He has probably forgotten more than I will ever know about fabrication, so he might come up with some good ideas, I hope. im also tempted to just copy the new KMG tiltable table grinder, it would take a lot of my guess work out of it. I like the idea of the ratchet stop, and it doesn't look like it would be hard to achieve, if I could find a supplier of ratchet wheels, or steal one from another machine. I will rejig my design a bit i think, im not entirely happy with the tensioning wheel arm part of the design, so it will change I think. Thanks again for your help Alan. Dunno, when I do small-radius curves smaller than the 50mm wheel I freehand it with a half-round file and then polish on a 1" wide J-weight (ultra-flexible) slack belt. Thanks. I have made a start on this and have roughed out the shape of the aluminium platen plate, while I wait on the steel delivery to land. im waiting on delivery of a bench drill. its a Meddings, its an old English make, very solid and accurate, and about 3 times the weight of the modern Chinese garbage, This thing will easily outlast me, and its accuracy will help with all the drilling and tapping im gonna have to do. im also going with the proper 3 phase motor and invertek VFD. Life is too short, the Chinese alternative wouldn't last very long, and its only money right. I will post some updates when there is something to see. there is something to see. Its starting to take shape now. ive got some wheels too but am waiting for the shouldered bolts to fix them. its a beast and weighs a ton, but it will be zero flex id say. its obviously not finished and I will be hacking more lumps of steel off it to lighten it a bit, but the basics are there. Couple of questions? do you think m6 bolts will do to hold the box framework together? And platen. im making the platen detachable, with a fixing top and bottom (platen plate will fix to 10mm thick angle. do you think the heat differencial will cause the platen to bend? im thinking not because I don't think it will get anywhere near hot enough, but value your opinions. ive also cut out roughly a couple of blanks.